Are you tired of eagerly waiting for your photos to develop and finding that your shots look just a touch blurry or that you didn’t focus enough on certain things? These are common problems reported by those who hold their cameras in their hands instead of setting it on a tripod. We highly recommend Zomei tripods because many other models from this company will also work as a monopod. 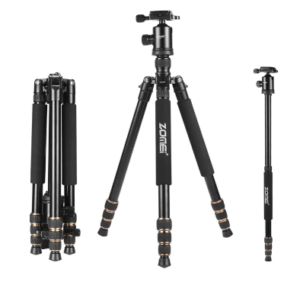 The Zomei Z669C Portable Carbon Tripod (Check Price on Amazon.com) is our top choices because it weighs just 3.4 pounds and is lightweight enough for taking on family vacations or carrying to the athletic field. It comes with a tripod leg that unscrews from the center for use as a monopod, but this leg set can adjust to different angles. 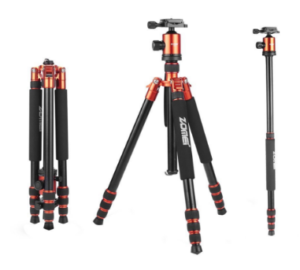 Though you should look at the top five tripods we found, we think you’ll love the Zomei Z669C Portable Carbon Tripod as much as we do. When picking a new tripod to use with your camera, you need to think about how much it weighs and whether it comes with a ball joint, plate or another device on top that can support your camera. We really like the Zomei Z669C Portable Carbon Tripod (Check Price on Amazon.com) because it can work with so many different cameras. This tripod folds down to 15-inches long and weighs only 3.4 pounds, making it easy to carry with all your other camera equipment. 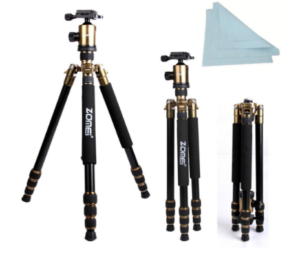 The attached legs make this a solid tripod that can work on wet ground, sand and even a table, but those legs unscrew off the tripod to create a monopod. You can hold that monopod with one hand to take shots high above the crowd or for getting your camera to a specific angle. As the legs on the tripod piece fold down, you can use the whole tripod at different angles too. Capable of reaching a maximum height of 60 inches, the Z669C has a quick release plate attached to the top that you can move a complete 360-degrees. You also get five sections on each leg with a twisting lock that makes it easier to change the length of the legs and lock those legs down. Tripods designed for use in professional studios are heavy and have thicker legs that make those devices harder to carry, but this Zomei Z669C Portable Carbon Tripod is actually a portable version that you can take anywhere you go. To make this tripod even better, you can unscrew the three legs that make up the tripod to use it as a monopod. This tall and then center column is just the right size and height for capturing shots well above your head. Lightweight and compact are two words that describe this portable tripod because it only weighs 3.4 pounds and measures just 14-inches long when you fold it down. You can also extend the tripod to hit a maximum length of 60 inches. Its center column has two separate pieces for placing your camera on top of the column or below the column. Zomei designed the tripod legs to let you adjust each one to three different angles, and adjusting those legs can help you compensate for any of the uneven surfaces you want to shoot on. Made from carbon fiber, the Z669C also comes with a ball joint/head on top that works with various types of cameras and a quick release plate that you can use at any angle that also allows for easy access of your camera. You get a pouch for safely storing the head and a case for the tripod itself. When you hit the road with this Zomei Z888 Compact Travel Professional Aluminum Tripod and your camera, you can make a great first impression and look like a professional too. This compact tripod combines elements of a portable tripod with one you would use in a studio and tosses in a bright red finish for added impact. The bright red accents used on the top and sides of this tripod will definitely turn a few heads. Designed to almost look like a squat little robot, this tripod has a total of four legs that include the three legs on the tripod and a center column. All four of those legs adjust to help you reach both the angle and height that you need. The legs also have the spiked feet that you need to push the tripod into the dirt or ground to get more stability and traction. The three legs that make up the tripod have locks that you just twist and untwist to extend or reduce the length of the legs, which you can do one at a time. If you prefer using the center column on its own, you can untwist the legs and remove the tripod piece and all three legs from the column. Weighing just 3.7 pounds, this tripod has a maximum height of just over 66 inches and can accommodate cameras from manufacturers like Samsung, Kodak and Sony. Whether you own a camera in a classic black shade or one with a case in a brighter color, you’ll love this Zomei Z818 Light Weight Heavy Duty Portable Magnesium Aluminum Travel Tripod, which has orange accents to add to its overall appeal. Designed for the digital cameras that professionals use, it can accommodate most DSLR cameras from Nikon, Canon and Sony. The ball head, which comes off the tripod, adjusts to fit your camera, and the quick release plate ensures that you don’t waste time fumbling with the tripod to get your camera off. As a 2-in-1 tripod, the Z818 is yet another model that you can use as both a tripod and a monopod. Removing the tripod legs turns the center piece into a monopod that can support your camera as you pan across the room or get more people into a single shot. Though it has a maximum height of 65 inches, folding down the legs reduces its length down to just 18 inches. Thanks to its built-in level, which is a type of bubble level, you can set the tripod up and adjust the legs to get the top completely level. Inside the packaging is an extra center column that you can use with the tripod, tools for making adjustments and the ball head. You’ll want to use the included carrying case to keep the tripod safe from moisture. 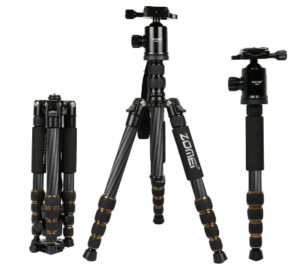 Though lightweight enough for taking on photo shoots, this Zomei 65″ Tripod Monopod is one of the longest tripods available and has legs that extend to a total length of 65 inches. Made from extremely durable materials like aluminum alloy and magnesium, this tripod can withstand exposure to all types of weather conditions without rusting and without showing any other signs of damage. As it has an overall weight capacity of 33 pounds, the tripod can support almost any still or digital camera. 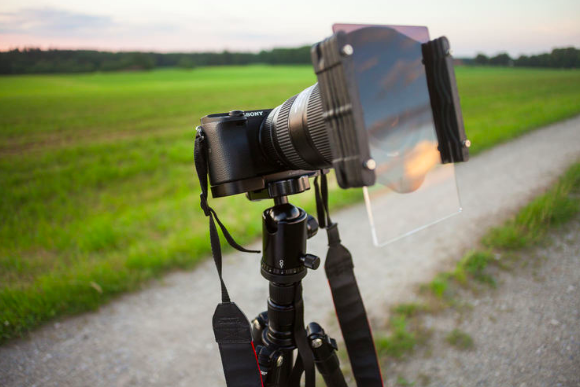 A quick release plate that fits on top of the center column on the tripod allows you to spin and move your camera without taking it off the tripod. The ball head that lets you use the tripod with cameras from Sony, Nikon and other top manufacturers comes off too. You get a pouch and case that can store each piece when not using them as well as an operational manual and a case for the tripod itself. Twisting locks on the tripod legs are easy to use and give you the freedom to adjust one or more legs at the same time and lock those legs to one height when shooting landscapes and other things. The tripod weighs under four pounds and folds down to only 18-inches long. This Zomei Aluminum Portable Tripod is one that the manufacturer refers to as a heavy-duty tripod because it can support the weight of the larger cameras and camcorders that professionals use. It works with all types of digital cameras as well as DSLR cameras but works best with those from Sony, Canon and Nikon. When you factor in the ball head, which adjusts to fit different camera types, the tripod has a maximum height of 62 inches. The tripod legs extend out from the sides of a center column to help you reach different angles and heights, but you can also remove those legs completely from the tripod and use just the center column as a monopod. When fully extended, this monopod is 14.5-inches long. Zomei made the legs from an aluminum alloy and added a rubber piece on each leg to prevent rust and other damage. Included with the tripod is a bag made from a soft material that is similar to silk, and this bag has a padded spot on the strap for carrying over one arm without the weight digging into your shoulder. Five separate sections on each leg extend out and up to help you set up the tripod based on the distance and angle of your shot. Is the Zomei Z669C Portable Carbon Tripod Really the Best? We really do believe that the Zomei Z669C Portable Carbon Tripod is the best because you can use it as a tripod or a monpod and because it comes with twisting locks for locking or unlocking the legs. You can extend the center column to a length of 60-inches and adjust the legs to use the tripod at different angles. The Z669C is easily the best tripod from Zomei. 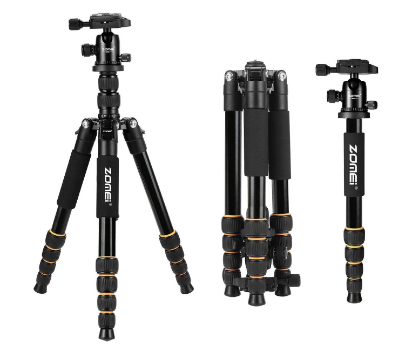 Buy The Zomei Z669C Portable Carbon Tripod on Amazon.com!